The anions HSO4- and SO42- can be involved to the process of iron’s subgroup metals anodic dissolution and passivation in sulfuric acid solutions. The possible effect sulfuric acid on the anodic behavior of nickel in acidic solutions was analyzed with mathematic modeling application. Our results have shown a decrease of maximum current on the anode polarization curve in the case of sulfate anions adsorption on the nickel surface. In this case the slope of Tafel plot of nickel active dissolution and the potentials of maximum currents may change. Maximum currents increasing have been occur in the cases as a direct involvement of sulfuric acid in the dissolution stage of nickel as inclusion of anions into the oxygen-containing films. It was found that anions of sulfuric acid practically didn’t influence on the anodic polarization curve of nickel electrode in the range of SO42- anion concentration from 0.2 to 1.2 Eq/L (pH = 1.0). These data allows to argue that the sulfate anions do not affect on the general mechanism of anodic dissolution and passivation of nickel. Petrenko, L. V., Korobov, V. I. Simulation anodic behavior of nickel in acidic solutions. Visn. Dnipropetr. Univ. : Khim., 2012, no. 18, p. 18-27. Bune, N. Ya. On the passivation of nickel in sulfuric acid solutions. Zaschita metallov, 1967, no. 1. p. 50-54. Kolotyirkin, Ya. M. Influence of the nature of anions on the kinetics and mechanism of dissolution (corrosion) of metals in electrolyte solutions Zaschita metallov, 1967, no. 2, p. 131-144. Burstein, G. T., Wright, G. A. The anodic dissolution of nickel – 1. Perchlorate and fluoride electrolytes. Electrochim. Acta, 1975, no. 1, p. 95-99. Zucchi, F., Fonsati, M., Trabanelli, G. Corrosion and corrosion inhibition of nickel in HClO4 solutions using the EQCM technique. J. Appl. Electrochem., 1999, no. 3, p. 347-353. 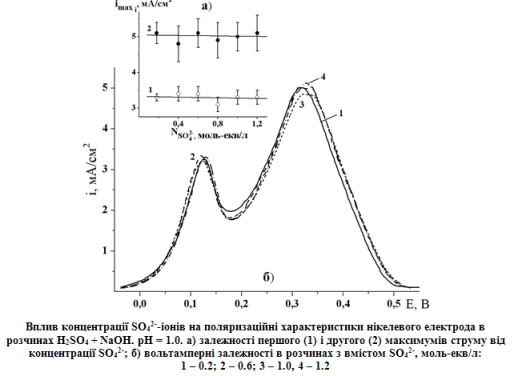 Dvorkina, R. M., Ilina, L. K., Lvov, A. L, Tyurina, L. V. Investigation of the kinetics of anodic dissolution of nickel in acidic phosphate solutions. Elektrohimiya, 1983, no. 7, p. 957-960. Novakovskiy, V. M., Trusov, G. N., Fandeeva, M. F. On the characteristics and nature of the anodic behavior of nickel before the second passivation. Zaschita metallov, 1969, no. 5, p. 503-509. Marshakov, I. K., Zotova, E. E., Protasova, I. V. Anodic dissolution of nickel from its own phase and phase NiZn intermetallic compound in acid sulfate environments. I. Nickel. Zaschita metallov, 2004, no. 2, p. 117-122. Florianovich, G. M., Sokolova, L. A., Kolotyirkin, Ya. M. On participation anions in elementary steps of the electrochemical reaction of iron dissolution in acidic. Elektrohimiya, 1967, no. 11, p. 1359-1363. Real, S. G., Vilche, J. R., Arvia A. J. The characteristics of the potentiodynamic potential/current profiles obtained with the Ni/0.5N H2SO4 interface. A contribution to the mechanism of the electrode process. Corros. Sci., 1980, no. 4, p. 563 586. Siejka, J., Cherki, C. Study of Passivity Phenomena by Using O18 Tracer Techniques. J. Electrochem. Soc., 1972, no. 8, p. 991-998. Vilche, J. R., Arvia, A. J. Kinetics and mechanism of the nickel electrode – II. Acid solutions containing a high concentration of sulphate and nickel ions. Corros. Sci., 1978, no. 5, p. 441-463. Schrebler Guzmán, R. S., Vilche, J. R., Arvía, A. J. The kinetics and mechanism of the nickel electrode – III. The potentiodynamic response of nickel electrodes in alkaline solutions in the potential region of Ni(OH)2 formation. Corros. Sci., vol. 18, p. 765-778. Lopovok, G. G., Kolotyirkin, Ya. M., Medvedeva, L. A. Effect of sulfate ions on the anodic behavior of nickel. Zaschita metallov, 1966, no. 5, p. 527-532. Novoselskiy, I. M., Hakimov, M. G. Kinetic theory of anode passivation dissolving metals. XV. Properties of the steady current-voltage curves describing the mechanism of inhibition of the electrode reaction at the free surface in two consecutive reaction products adsorbed electrochemical adsorption. Elektrohimiya, 1974, no. 1, p. 86 91. Kolotyirkin, Ya. M., Popov, Yu. A., Alekseev, Yu. V. On the mechanism of the influence of anions on the kinetics of dissolution solution metals. Role of the solvents. Elektrohimiya, 1973, no. 5, p. 624-629. Grden, M., Klimek, K., Czerwiński, A. A quartz crystal microbalance study on a metallic nickel electrode. J. Solid Stat. Eletrochem., 2004, vol. 8, p. 390-397. POKER ONLINE BONUS 200$ FOR CLICK DESCRIPTION REAL NO HOAX !!! !